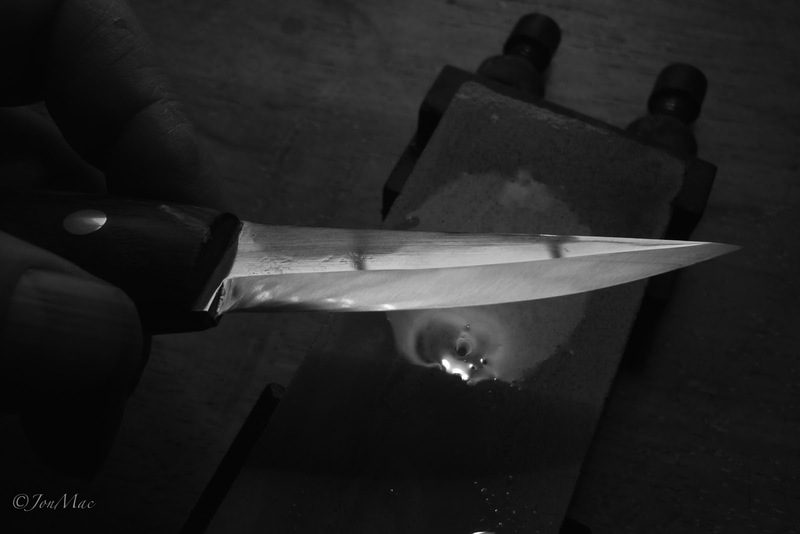 In this post I thought I might point out a way of using light to help tell if your spoon carving knife is nice and sharp. As a user of the 'Scandinavian' type of bevel you'll understand that the two bevels on your knife need to be nice and flat across the grind, culminating with a good sharp cutting edge. Now, in an ideal world our sharpening stones, whatever your choice, will be absolutely flat. However, we carry on reguardless. If I look at my bevel, in the sunshine, prior to sharpening, it has a uniform shine from tip to handle and from cutting edge to sholder. It has a polished look about it. 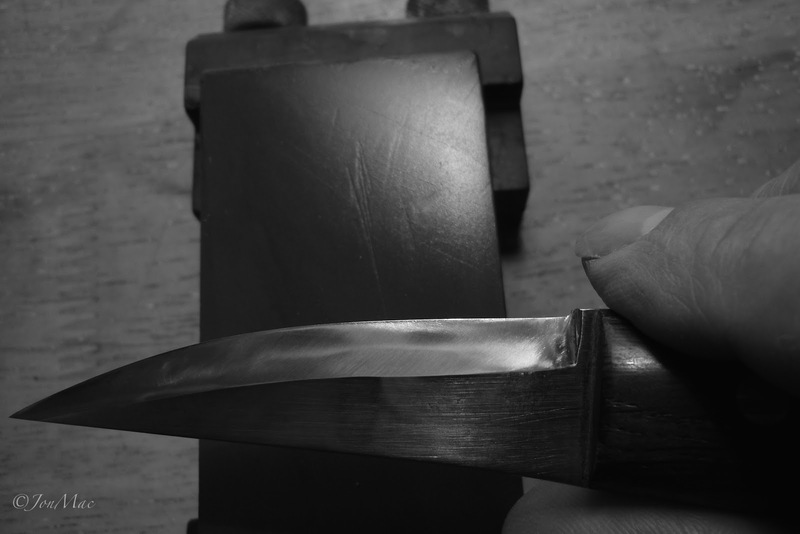 When sharpening, starting with a course stone (1200 grit), the flat ground face or bevel is presented to the stone and held as flat as possible onto the sharpening stone during the sweep from one end of the stone to the other. When a few sweeps are completed, I have found it worthwhile to wipe the blade and flash the blade under a lamp, or in sunshine. You'll notice the shiny surface has been replaced by a duller, scratched surface. You can use this affect to tell if you have managed to keep the bevel flat. 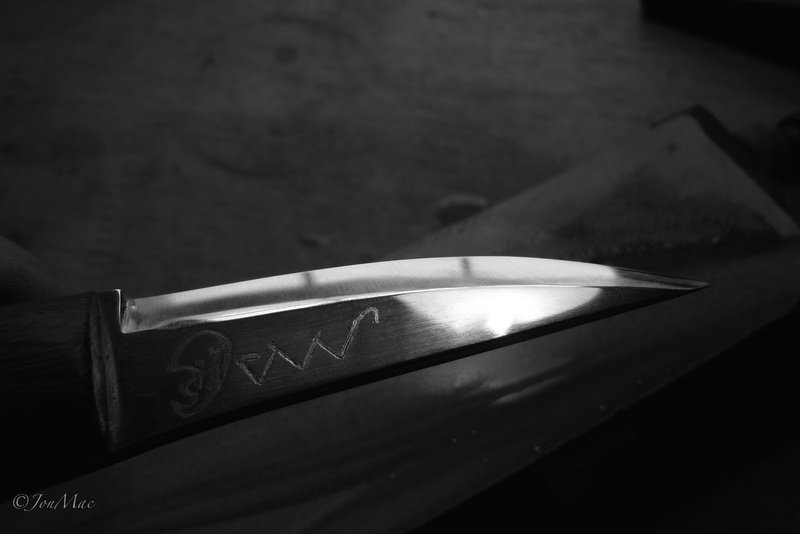 Have a look across the bevel length from tip to handle. What I look for is a uniform replacement of the shiny surface with a dull surface. If any shine is left, then it indicates that I have not been successful in keeping the bevel flat. This next photo shows a slight shine at the cutting edge toward the halfway point from the handle end. This can be rectified by paying closer attention to the sharpening process at this point. This next photo shows a nice uniform dull surface. The whole bevel has received the attention of the stone. The polishing process on your finer stone (6000 grit) is the same, but reversed. Moving from a uniform dull surface, to a uniform polished surface. If you're inclined, a little light strop will give it a keen edge. And were back to sharp once more. I hope this little top tip will help some of you who are newer to the whole sharpening process. You can find a whole raft of sharpening tips if you follow the link below.